Historical editions of the Royal Mint's flagship coin such as the Gold William IV Sovereign that was minted from 1830-37 are always in demand. These classic coins are attractive to collectors, and as each William IV Sovereign dated from 1830 to 1837 is struck from .916.7 pure gold, these iconic coins are considered an excellent investment. Only a few collector's coins can be said to be as distinguished as the classic Gold Sovereign. When the Sovereign was first issued in 1489 during the reign of King Henry VII it was England's largest gold coin and had a face value of twenty shillings. It was struck every year until the end of Tudor rule in 1603 but was reinstated as Britain's favourite coin during the coinage reformation of 1817. This popular William IV coin is an outstanding example of the post-Victorian Gold Sovereign. The coin's overall design features are among its most compelling details. Its reverse shows the famous crowned shield and mantle design by Johann Baptiste Merlen that replaced the George and Dragon design favoured for much of the Victorian era and the coin's date of issue. 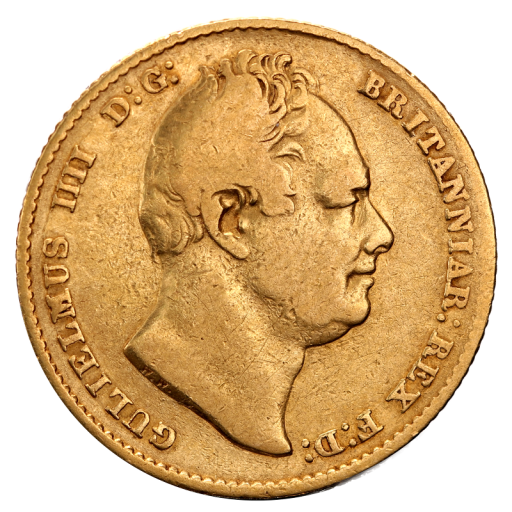 The obverse carries the famous bare-headed bust of HM King William IV facing to the right, his nose level with the second 'I' in BRITANNIA in the Latin inscription '"GULIELMUS IIII D:G:BRITANNIAR:REX F:D:". Although 1830-37 William IV Gold Sovereigns still have the same twenty shilling, or one pound, face value as the first Sovereigns issued in 1489, their true value far exceeds that. Coins from the first half of the 19th century are in limited supply and always in great demand so, should you choose to trade your coin in the future, you can be assured that the William IV Gold Sovereign 1830-37 has excellent resale potential. And, as legal currency in the United Kingdom, all profits are exempt from Capital Gains Tax. Add the William IV Gold Sovereign 1830-37 to your basket with coininvest.com today and enjoy fast, secure shipping to your preferred address. Be sure to add gloves to preserve the beauty of your coin and prevent further wear.